Natural, translucent liners are an economical choice. 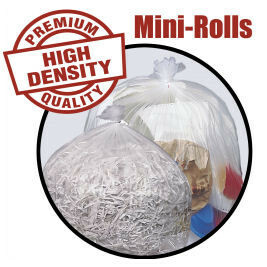 Packed on rolls to make dispensing easy. Puncture resistant and performs well in temperature extremes ( -40°F to 212°F). MR-24330-MC - 12-16 gal. liner, 8 mic, 24" x 32", 1,000 liners per case, max load - 20 lbs. MR-33403-MC - 33 gal. liner, 16 mic, 33" x 40", 250 liners per case, max load - 75 lbs. MR-40483-MC - 40-45 gal. liner, 16 mic, 40" x 48", 250 liners per case, max load - 75 lbs. MR-38603-MC - 60 gal. liner, 16 mic, 38" x 60", 200 liners per case, max load - 75 lbs. MR-43483-MC - 56 gal. 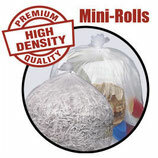 liner, 16 mic, 43" x 48", 200 liners per case, max load - 75 lbs.